Firstly I want to be clear that I have had some measure of success on Steam and I’ve enjoyed going to Steam Dev Days and other events and talking to their reps who seem to be genuinely interested supporting indie developers. So this blog post is not about me hating on Steam, rather it’s to discuss a recent issue that has impacted my sales and the sales of many other indies too. Here’s a huge Steamworks forum post about the issue (you have to be logged on as a developer to read it). In early October Valve changed something in their discovery algorithm and introduced a bad bug which meant that Steam was only recommending some big name games instead of relevant games, oops! Valve fixed the October discovery bug quickly (within a week I think) but since then many indies have seen a big dip in their traffic from “Other Product Pages” and “Home Page”. Other product pages includes a sub-category of “Discovery Queue” and traffic from that source appears to have decreased significantly for me if I compare before and after the October bug. You can see that Other Product Pages has gone from being my top traffic source with 305 visits to a mediocre traffic source with only 91 visits. This effect can also be seen on the traffic graphs in Steamworks (click image below to enlarge it). The orange line is “Other Product Pages”. I ran a weeklong sale at the start of Oct but straight after the sale finished the traffic from other product pages dropped and stayed low. The other two peaks are the Steam Halloween and Thanksgiving sales. I can see the same drop in traffic for two of my other games and some devs have showed me charts with an even more severe drop. 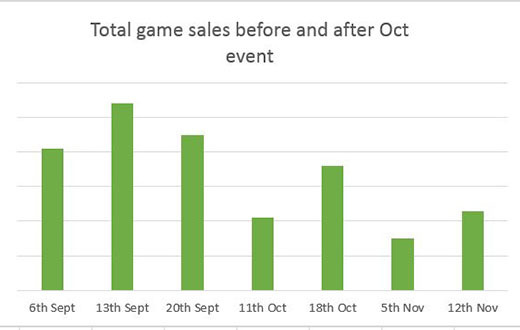 I compared full price sales before and after the October bug (being careful to avoid weeklong sales and Steam sales) and my total units sold have halved. Revenue has dipped even more because our most expensive game has dropped to 36% of previous unit sales. I’m not sure if this issue also affects traffic during a) discount sales and b) game launches because those are a lot harder to analyse like for like, but based on some data I’ve seen from other developers I’m suspicious that those things may also be impacted. Has this issue affected all indies? I’ve heard in private that some games are either not affected by this issue or have actually benefited from it with increased traffic! It stands to reason that if many devs are losing traffic, then that traffic must be going elsewhere. That said, a huge number of smaller indies have been hit hard by this issue, harder than me, with traffic and sales dropping to near zero in many cases. Have I told Valve about it? Like many indies who added games to Steam since Steam Greenlight I don’t have an official rep. However I did email a couple of reps who I got business cards from and they said they would look into it, but I haven’t heard from them since then. Admittedly I should chase them up but I was waiting to see if the problem resolved itself, but it’s been ongoing for two months now. Other indies I know have emailed their reps but I haven’t heard anything positive yet. Here’s the data I sent to Valve (click to enlarge) along with screenshots of the traffic graphs. Fellow indie dev Danny Day has suggested that the discovery algorithm may have a historical data component to it and after the initial October bug the historical data got trashed and so the algorithm is not giving the same results as before. 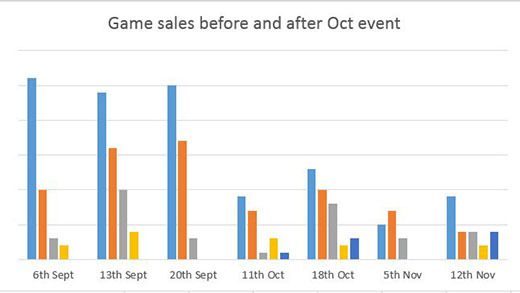 October/November is also AAA release season and includes two Steam sales so it’s possible that our sales are impacted slightly, but that doesn’t explain the sudden huge drop off in discovery traffic that many indies are seeing. Another possibility is just that Valve changed the algorithm to highlight different games and some devs have benefited and others have not. It’s even possible that Valve shifted some kind of slider from “show a variety of indie games” further towards “show popular games that earn more money”. They are a corporation after all and corporations like to make money and they don’t have any real obligation to help out smaller indie teams. This particular point seems evident when taking into account the recent news that games grossing over $10M will receive a greater share of the revenue but struggling indies will not. Also I’ve heard Valve say multiple times that they put the customer first (understandably) and so they probably believe whatever changes they make improve the experience for customers. But I must stress that the above points are just theories, we haven’t heard anything official from Valve yet. 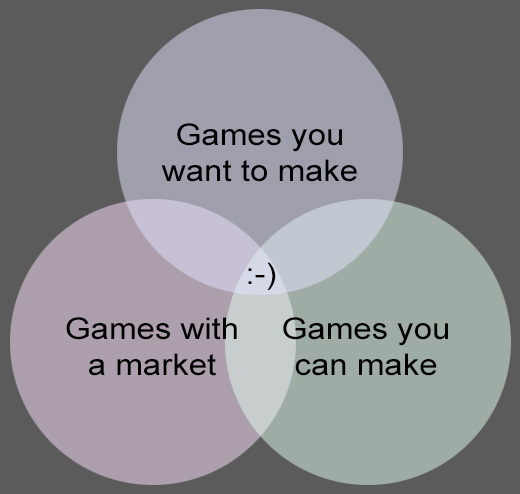 So, should I double down on selling direct or use itch.io? Well I’ve been selling direct since 2006, but sadly my direct sales are about 1% of my total revenue. I need distributors like Steam to survive. I wish it wasn’t that way, but it is. Btw, you can buy all my games direct from me here. I get 100% of the revenue minus a small processing fee, so it’s amazing and the best way you can support indies is to buy direct. The second best way is to buy through itch.io because they only take a small fee (in fact developers can set it at a rate they think is fair). I haven’t put my games on itch.io yet because I’ve heard that sales on there are very low and I’ve been busy with potentially higher value tasks. However, I will try out Regency Solitaire on there soon and see how it gets on as I’d like to support the platform now more than ever. Check out these Twitter threads for more discussion with other devs who have also shared their data. In the past I have felt positive about Steam, but these discovery changes and the recent revenue share changes that are only relevant to hugely successful games don’t make me feel particularly positive about the future of selling games on Steam. In fact I’d go as far as to say I’m worried.